The first in a new series and a new author for me. In Fallingbrook, Wisconsin, Emily Westhill has open a Donut Shop with her Father-in-law, Tom after the death of her husband a few years ago. It is named after her cat, Deputy Donut aka Dep. The pair established the shop as Emily had many requested to buy her donuts. The shop has become popular with the police department. Tim was the police chief for many years. Tom fixed the office as a cat so she is with them during the day but not breaking any health code laws. One of the regular knitknickers group Georgia Treetor is late for coffee and we meet Lois Unterlaw , a close friend of Georgia. Later the Knitkniters picked up Emily and they go to Georgia’s home to find her dead. Lois becomes a person of interest in the murder. Emily works with her husband partner to clear Lois. The ending will please you. Dep has a special role in the story. I am looking forward to Emily and Dep’s next adventure. I highly recommend this book. Recipes are included. Disclosure: I received a free copy from Kennington Books through NetGalley for a review. My thanks to them for the opportunity to review this book. The opinions expressed are my own. 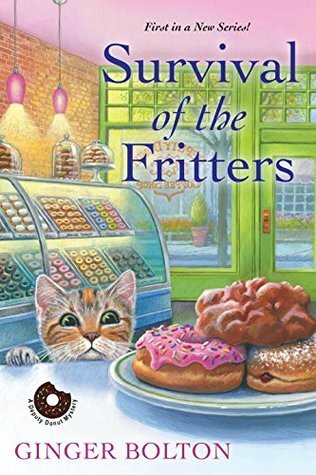 This entry was posted in #NetGalley, Books, Uncategorized and tagged catdonuts, cozy mystery, Dep, Deputy donut, Emily, Favorite, Ginger Bolton. Bookmark the permalink.